Most recent Autism Related News:	Note the subsection scroll bar on the right. It’s happening all over: Kids use nutrition, special diets, and biomedical tools for autism. They make stunning progress. They blow through ABA trials instead of trudging along; they approach peers on a busy playground; they look their parents in the eyes and start talking; they function at school, and teachers’ jaws drop. Wow! So, mom tells the pediatrician, the neurologist, the developmental pediatrician, the psychiatrist – all those first point people who usher a family into life with autism. OMG! Look at this kid, right? Great news, right? Wrong. These are also the people who told mom not to bother with the nutrition piece of this puzzle, the ones who chanted “diets don’t work”. These are the experts after all, the big guns, and families buy the biggest MD guns they can afford when autism comes calling. But now the very people who diagnosed the kid in the first place have nothing to say. They don’t tell their colleagues, don’t investigate, don’t want details. Therapists for speech, behavior, and OT are impressed, and teachers too, but the child’s doctors are not among the converted. In fact, they’re not even interested. We have enough knowledge and evidence-based practice on child nutrition right now to redirect the lives of hundreds of thousands of children with autism. It’s painful to read about cash-heavy non-profits, hospitals, or universities, complete with staff paid well into six figures, who can’t seem to sort out what to do about this “mysterious” condition. Or to know that there are some 70,000 registered dietitians sitting on their hands in the US right now, because the American Dietetic Association – like the American Academy of Pediatrics – refuses a leadership posture and won’t train people on what to do with nutrition care tools we already know how to use. 4 Paws was the first agency in the United States to begin placing highly skilled Autism Assistance Dogs and the first agency known to place these assistance dogs with tracking skills. Read more about autism assistance dogs in action. (NaturalNews) On April 2, 2008 CNN spent the day bringing awareness to the problem of autism. Larry King's segment, which included Jenny McCarthy along with a panel of guests, was particularly enlightening. Using infant macaque monkeys, University of Pittsburgh's Dr. Laura Hewitson, Ph.D., described how vaccinated animals, when compared to unvaccinated animals, showed significant neurodevelopmental deficits and "significant associations between specific aberrant social and non-social behaviors, isotope binding, and vaccine exposure." Researchers also reported, "vaccinated animals exhibited progressively severe chronic active inflammation whereas unexposed animals did not" and found "many significant differences in the GI tissue gene expression profiles between vaccinated and unvaccinated animals." Gastrointestinal issues are a common symptom of children with regressive autism. Why Fourteen Studies done for the pharmaceutical companies fail to fairly and accurately answer the question, "Do Vaccines Cause Autism?" - No real world studies of the vaccine schedule have ever been done. - Many of the studies reach false conclusions or conclusions that have nothing to do with the simple question: do vaccines cause autism? A look at 14 studies "used to support the false assertion that vaccines do not cause autism." Note: Our news page has moved. Newer stories relating to autism are here. February 2008: Rebutal letters to BMJ re: recent "MMR does not cause Autism" article. 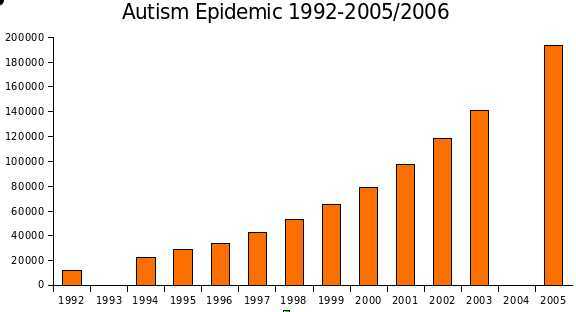 An article showing the drop in autism that occurred after the MMR vaccine was removed from the market in Japan. A lymphocytic enterocolitis has been reported in a cohort of children with autistic spectrum disorder (ASD) and gastrointestinal (GI) symptoms. MMR Fact Sheet from Vaccination Liberation. Good graph of Incidence of Autism in Denmark by Age Group. Source: The Danish Psychiatric Central Register, the same source as the NEJM 'Danish Study'. 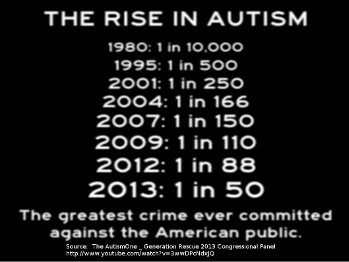 Also a discussion of how a dramatic increase in autism followed the 1987 introduction of the MMR vaccine. This page lists the names of individuals and organizations that may be able to provide remedies for people suffering from vaccine damage. ^ Pasteurized Milk and its Link to Autism, Part I, Dr. Mercola site. Mentions the benefits of raw milk and fermented raw milk products. ^ Heat-Killed Bacteria's Role in Inducing an Innate Immune Response and its Possible Link to Autism, Dr. Mercola site. ^ Specific Carbohydrate Dietary Trial: on www.breakingtheviciouscycle.info site. ^ More Autism in vaccinated: www.voicesofsafety.com Home Page....Click On - "Public Health"
V50.2 - Standard for Eliminating Mercury and Triple Vaccines and Permit Freedom of Choice. Mercury,  MMR/DPT Vaccines   and Genetics as Causal Factors in Autism. V50.2 makes that point that vaccines are not simply ineffective at preventing disease, but actually bias the immune system such that vaccinated children have more of the target disease than the unvaccinated. V50.2 and V50.2A confirms that vaccinated have more ill health because of assorted Vaccine Induced Diseases (VID). V50.2A also confirms that removing Mercury (Thimerosal) from vaccines will be only a modest beginning at preventing Autism because only 18 percent of of Autism is attributed to Mercury while 62 percent is attributed to MMR and DPT vaccines. V50.3A - Standard to Delay Vaccinating Newborns. See the link below for links to the Standards as well as links to the Research Reports. "About $3.2 million to take care of an autistic person over his or her lifetime." Washington, DC (LifeNews.com) -- Two pro-life advocates say a new study conducted by the Environmental Protection Agency shows a correlation between the use of cells from babies in abortions in vaccines and an increase in autism rates. They say the study provides another problem from pro-life advocates who are already concerned about the abortion-vaccine tie. 72 patients studied in Department of Paediatrics, University of Catania, Italy. ^ 1. Autism: a Novel Form of Mercury Poisoning Including a testamony on Oral Chelation therapy and improvement in a case of Autism. Long article with many footnotes. Aim for the ones in bold. Can Autism (And Other Vaccination Disorders) Be Cured? Tedd Koren's July 2001 newsletter. Childhood vaccines are giving us a world of chronic illness: autism, developmental disorders, Asperger's Syndrome, brain tumors, leukemia, cancers, information processing disorders, impulsive violence, allergies, asthma, diabetes, Crohn's disease, intestinal disorders. (all conditions rare before mass vaccination) are just some of the vaccine associated disorders. But what to do about these damaged children? Aren't autism and related conditions permanent? I always thought so until I met one woman who is very active in the anti-vaccination movement. "My child was severely, profoundly autistic due to a DPT shot," she told me. "We were told he was permanently brain damaged. Today no one believes me, he's a normal healthy child." I was stunned. "What did you do?" I asked. "I left no stone unturned. I eventually contacted the New England School of Homeopathy and Dr. Paul Herscu, an educator, speaker and writer." "At our consultation he said he wanted to videotape our son. I said, 'no way, I don't want his horrible condition recorded.' But Dr. Herscu insisted. I'm so glad he did, because today no one believes he was ever autistic." "He used homeopathy?" "Yes, classical homeopathy and also cranial osteopathy, we also did some color therapy for his vision." This was a revelation to me. I called Dr. Herscu: "I've seen about 400 adults and children with autism and I think maybe 3 or 4 did not respond favorably" he told me. He also helps those suffering from other forms of vaccine damage. When I speak at seminars I'm often asked about what to do for vaccine damaged children. In addition to chiropractic care, (including cranial work), I recommend classical homeopathy, craniosacral therapy and/or cranial osteopathy, and nutritional work. We see too many damaged children and no potential source of healing should be ignored. The New England School of Homeopathy is at ^ www.nesh.com Dr. Herscu can be reached at 860-763-1225. The cranial osteopath my friend used is Dr. Mary Bayno, 212-765-6474. Both Herscu and Banyo may know someone in your area, (or it may be worthwhile to have your patient travel to them). A craniosacral practitioner can be located at ^ (www.upledger.com). A classical homeopath in my area is Peter Prociuk, MD at 610-701-5702 who also works with autistic children. However, we receive many calls and emails from parents who did vaccinate their precious child, only to find out that the child is permanently damaged by the onslaught of poisons. Many children have died from them. I have decided to compile a list of various remedies, links to products and some practitioners. These are just a few solutions that I know about. My disclaimer: This info is compiled from various folks who have used these to help themselves. Please consult with the proper health care professional. Preferably a holistic one. All heavy metals and toxins are positively charged. Three years ago I stumbled onto a magnetic clay bath that has been proven to remove the heavy metals and toxins simply by soaking in the clay bath for about 20 minutes. I had mercury poisoning from dental amalgams, which thankfully I did remove. This magnetic volcanic clay is negatively charged, thereby pulling the positively charged metals and poisons out. This is more effective than chelation therapy, plus cost effective. The average clay bath is around $44. For severe vaccine poisoning, the best baths used are the Environmental Clay Bath Kit, Mercury Clay Bath Kit, and Aluminum Clay Bath Kit. The Environmental and Aluminum Clay Baths are perfect for chemtrail detoxing as well. I found this link on some homeopaths and other practitioners that specialize in reversing the damage. Vaccines often contain live and killed viruses. There is now evidence of Simian Virus 40 (SV-40) which is a cancer type virus discovered in live oral polio vaccines. With that in mind, it is necessary to consider bioelectric medicine. There are frequency-generating devices known as Rife Instruments. To find out more about Rife frequency type generators check this website for various models. There is a section where you can buy good used equipment. Dr. Len Horowitz has written several publications and recorded several audio and videotapes on the dangers of vaccinations. He has developed a product called Vaccine Recovery Formula that countless parents have used successfully. Find out more about this fantastic product at: http://www.tetrahedron.org His book Healing Celebrations details the 5-step process in regaining health for children and adults alike. Or call Healthy World Distributing at 1-888-508-4787 for a free catalog. Note: http://www.healthyworlddistributing.com/ is now known as: https://www.healthyworldstore.com/. Good clean water is a must to flush out the poisons. This is water with no fluoride or chlorine added. Those are known carcinogens. Skin products are important as some children and adults both are sensitive to what goes on their skin. I prefer the Miracle II Soap and Neutralizer. The Miracle II Neutralizer has a pH of about 8.4 and can be taken internally as well as used topically. It also comes in a gel. Dr. Len Horowitz also carries the Miracle II products. There are other great natural products that you can find at the health food store. Aubrey Organics carries a fantastic product line. Read the labels on all products. Just because it’s in a health food store, doesn’t guarantee it being a pure product. I have a comprehensive list of carcinogens posted at the cloud-busters.com forums. http://www.vaclib.org/basic/Carcinogen.htm replaces http://forums.cloud-busters.com/All%20Other%20Issues/5405/ I have it in Microsoft Word format as well. Email me using the Contact Page for: Donna Services4Health for a copy. The Hepatitis A and B vaccines are a major assault on the liver. Your life depends on a perfectly functioning liver. Rebuilding the liver is a must. These herbal extracts are excellent for a damaged liver. They are Milk Thistle extract, and Olive Leaf extracts. These can be bought in a health food store, but several naturopathic physicians carry them which are stronger that the store bought brands. Doc von Peters has some great liver and kidney homeopathics. His email is: pres@fnun.edu Antioxidants such as Vitamin C are good. Vaccine damaged children and adults both benefit from chiropractic care. Oftentimes, there is nerve damage from vaccinations. Chiropractors adjust the spine to allow the nervous system to function properly. Kinesiology can balance a person’s energies. Vaccination can mess up the body’s electrical system. For those who can’t find a kinesiologist in their area, they can benefit from the Energy Health Care Workshops that are held in selective areas. http://www.ehealthcareworkshop.com/ This is simply using a red laser pen along with some basic kinesiology to remove blockages. The manual is free to download in Word format. Whether you believe it or not, the establishment has been implanting us with microchips for at least 20 or 30 years. These are administered via vaccinations, surgeries and dental work. Dr. Len Horowitz also has a videotape called Anthrax, Smallpox, Vaccinations and Mark Of The Beast which he talks about this. Here are some links that talk more in depth about this problem. What's Up With the Occult Ucielli di Merdas? New Poison Darts? I have most of it laid out here. It’s now up to you what you do with this information. Various folks and dear friends who serve God by helping humanity provided all these links. Causes, vaccine issues, prevention and treatment are covered in the book. "Sears's book sends the message: Autism is treatable; kids can improve and even recover with biomedical intervention. It's packed with information on alternative medical treatments for autism--everything from GFCF diets, probiotics, supplements, chelation, and hyperbaric oxygen treatment. He explores the concomitant health problems your child may have and how to eliminate/reduce them. Things that took me years to learn about on my own, are explained in this book." I'm new to the group, so you may have gotten the news, but there's a book just out by Jacquelyn McCandless called "Children with Starving Brains." Jacquelyn told me on the phone that her book is unique because it not only diagnoses autism as largely an effect of vaccination (thimerosal), but it gives a TREATMENT PLAN for children suffering from autism. An email link is at the bottom of the above web page. He is also active in the international endeavor to bring the dangers of vaccination to light. At long last, the book you've been waiting for about homeopathy has arrived!! Many of you may be aware of Amy's story about her son, Max, who was cured of autism with homeopathy ^ (http://www.renresearch.com/autism.html). Impossible Cure includes the full story of Max's cure, along with many other testimonials of homeopathic cures for a wide variety of physical, mental, and emotional conditions. Described as "one of the best introductions to homeopathy" available, Impossible Cure has also been called "one of the most complete pictures of homeopathy ever written." An ideal book for patient education and first-year students of homeopathy, it covers homeopathic philosophy, history, scientific studies, and a thorough patient education chapter about what to expect during treatment. It also addresses the issue of vaccination and its impact on our children's health. - Larry Dossey, MD -- Executive Editor of Alternative Therapies in Health and Medicine, Author of "Healing Words"
Impossible Cure will be in stock in early April -- and is now available for advance ordering. The first known cause of autism was rubella virus. This has been known since the 1960s. Live rubella virus is one of the three live viruses in the MMR vaccine. People who are pre-disposed to have a mitochondrial dysfunction can develop autistic conditions following vaccination. Mitochondrial dysfunction is claimed to be “rare” but is not. It can apply to a minimum of 20% of cases.